I’m 7 years old. I live in Belmont, California with my twin brother, Alex. I love LEGO toys and I also enjoy drawing, video games, reading, biking and going to the beach. My family loves the aquarium and the ocean too. An interesting fact about our family is that we’ve never been to Disneyland even though we live in California! 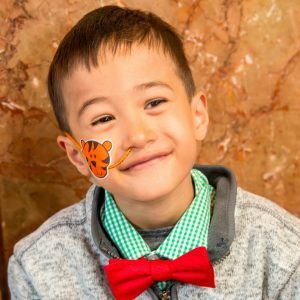 When I was 5 years old, I was diagnosed with stage 4 neuroblastoma. As a Candlelighters NYC kid, my favorite experiences include spending time at Barbara’s apartment, getting my nails painted by Ellie and playing with Teddy. My parents say their favorite part of the Candlelighters NYC family is having their support and meeting other families through the organization. …And my family uses these words to describe Candlelighters NYC: Support for everyone in the family! Click here to donate to Candlelighters NYC in honor of Tyler.